5 States Assembly Polls happening since the past few weeks are considered as Semi Final for 2019 Lok Sabha Elections. Results to be announced on Dec 11th could change the National Politics. If BJP retains power in Madhya Pradesh, Rajasthan, Chhattisgarh and put up a good show in Telangana & Mizoram, Modi will have good chances of retaining power in 2019. On the other hand, It's a do or die situation for Congress. This National Party will have to come back to power in most of the 5 States to give itself a chance in 2019 Lok Sabha Polls. The real test for Anti-Modi Front is going to be on December 10th itself. Chandrababu Naidu has been claiming he took the initiative to form the front with the help of Congress. First of all, TDP Supremo has to accept that many parties have been part of UPA even before he began meeting various national level leaders. 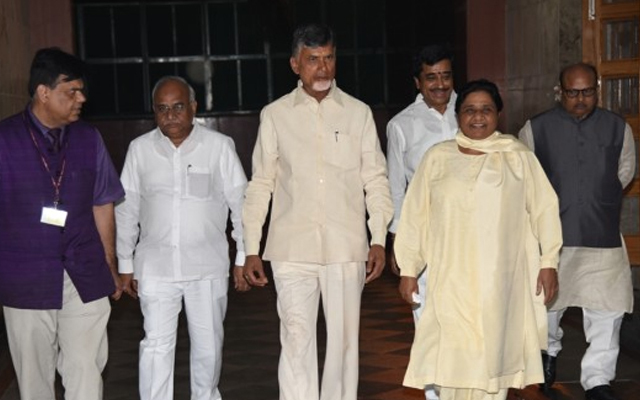 Chandrababu Naidu convened meeting of parties to be part of Anti-Modi Front on December 10th. Whether or not, BSP Chief Mayawati attends the meeting is a million dollar question as she differed with Congress in many aspects. If she doesn't attend the meeting, That's gonna be a huge blow to the Anti-Modi Front as Uttar Pradesh is the most crucial state for either NDA or UPA.